Investing strategies are an extremely personal thing. I started looking at our investment strategy and I wanted to give a little color on what it is and how we think about it. First things first, we are using the market to do most of the heavy lifting at the moment. We might diversify into some real estate here shortly, but for the time being we are not concerning ourselves with real estate, for a variety of reasons. We’re also subscribing to the “4% rule” to give us a rough guide as to where we need to get. Save enough income so that your withdraws are 4% of your total portfolio value. In other words, your portfolio needs to be 25x your spending. Now, I was thinking about this in respect to how you get there. Like most folks, we’d like to have a bond shield to help balance out the volatility in the market. We’d also like to have a little bit of a cash cushion so that we don’t have to sell equities at inopportune times. So, we’re thinking somewhere around 80-10-10 split for equities-bonds-cash. See how the constant contributions build over time. See the Layers adding on as you get closer to your goal. 100% Equities – To hell with the rest of it!! What is the best possible path to take? And here’s where the conundrum lies. When I built the model to get a certain value, all of these different attempts make it there. And the ending balances are within single digit percentages. Really the difference between them is the assumption return rate on the various asset classes. And Lord only knows how accurate that is. Constant Contributions – the Pros are that it has a little less volatility. It allows you to have a little bit smoother ride to the goal. And therefore you end up leaving some of the gains on the table. Is this bad? Don’t know, it depends on your appetite for volatility. You also have to re-balance your portfolio every so often so that you maintain your allocation. Layer Cake – The hybrid of the Constant Contributions and the All-In gives you a bit of both worlds. 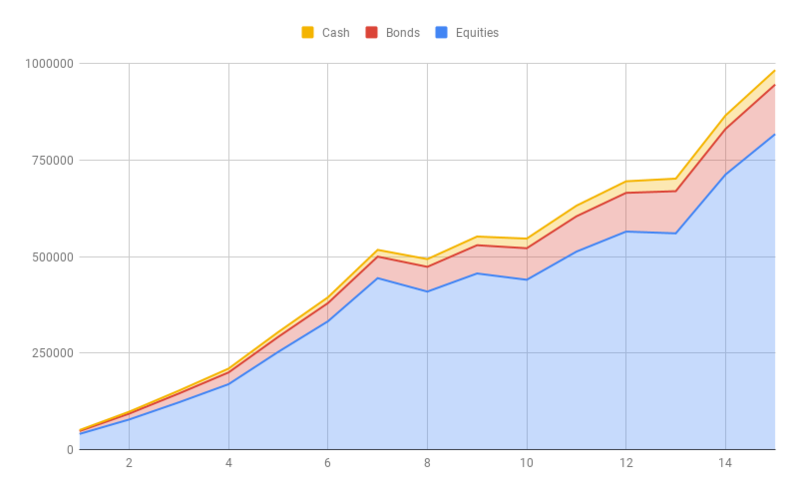 You get to max out everything going into the riskier investment classes the whole way, until the very end. Hoping that you hit the right time in the market. Then you ignore the equity portion of your portfolio and layer the safety on top of it and create your stable assets on top at the end. This should give your underlying assets a chance to start compounding. But again, you’re losing out on some of gains since you’re not investing everything into the highest returning assets. All-In – Here we get the highest theoretical returns, but we also have the highest volatility. You also have the simplicity of just throwing your money into one bucket. Now, that one bucket might spring a leak and you have to just keep throwing money into it. In theory you can get there quicker, but that’s only if the market agrees. You can always take some of the top once you need access to some cash. I spent a good amount of time building a model to get those beautiful charts up there. And you know what? I came to the conclusion, it doesn’t really matter all that much how we build it. The most important part is that we are constantly investing the whole time through all the fluctuations. And that’s where it gets personal. I can’t tell you what you should do. There’s one person that can, and that’s YOU. But, I’ll say this, after the last 2 months of activity in the market, you’re getting a glimpse of what’s possible. And that’s just a glimpse, imagine if this continues for a year or more? Can you stomach it? We just watched 10% of our wealth evaporate in the last two months. That certainly wasn’t easy, but we have faith in the system, and we are still bringing in an income so we can hold up against these current market fluctuations. While we have the income, we are buying as much as we can each month going forward. It certainly is a little unnerving to put money into an account to look at the balance the next day and see it go down?! We talked about this before, we can’t be concerned with that. We can only concern ourselves with what we can control. And so, we keep feeding money into the fire. And really, when it comes down to it, that’s the most important part. The allocation be damned, as long as you are continuing to add to it, the allocation is a secondary thing. So, the choice really comes down to what allows you to sleep comfortably at night. As for us, at the moment, we’re all in. I’ve always thought that we would do more of the Layer Cake approach as we got closer to our goal. And I still think we might go that route, as it will be nice to have a little cushion on top of our equities, which will do most of the heavy lifting. But I’m second guessing that at the moment, and thinking about just sticking with all in, then shifting only what we need at the time. It’s easier to keep track of, I have other things that I want to spend my time thinking about. Don’t know, it’s personal, so any other considerations we should be looking at? I agree that your biggest factor in the growth phase is constant new contributions. If there’s only a fraction % of difference in outcome then there’s no point in spending a lot of time thinking about. Trajectory is more important than specific milestones. Trajectory is definitely way more important!! The allocation is a small portion during the growth stage. Oh, that “system” it’s a magical thing right? It will treat you right and is great if you look at one side, and it’s destroying everything that we hold dear on the other side. BLAH!! But it certainly makes finances work!! We had invested basically 100% in equities except for our emergency fund for most of my working career. Only in the last three or four years that I worked did I begin to add bonds and cash. 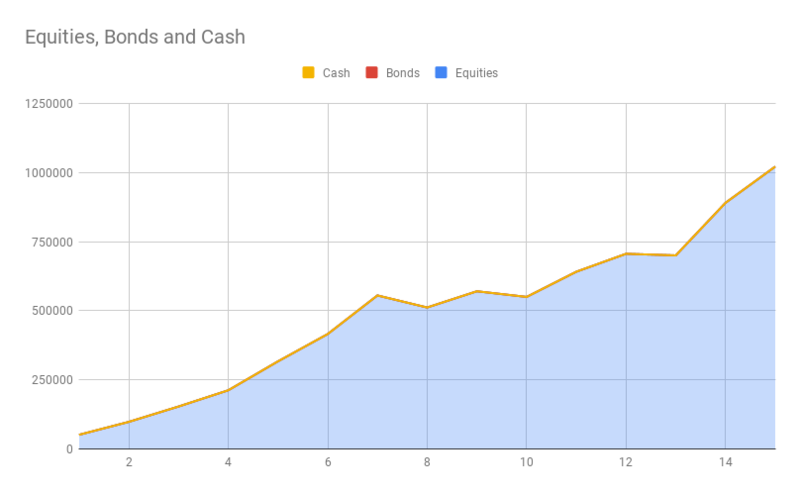 Now that I am mostly retired we only have about 50% in stocks, but I also have a zero withdrawal rate and never expect to exceed a 2% withdrawal rate even if I quit earning entirely. No real reason to take the risk of high stock percentage since I’ll never need my portfolio to do more than barely keep up with inflation. Oh man… That was our mantra while running the marathons. “We’re officially one step closer than we were last step.” Just gotta keep on going. But yeah, the savings amount that we are putting in definitely makes up for any real variations in the market at this point. we had about 100% equities up until a couple of years ago. i just hit age 50 this year and mrs. me hit 55 so social security can be only 7 years off for her if she elects to take it then. all that being said i shifted about 15% of the portfolio to preferred etf’s a couple of years ago as the yield was 3x the yield of bond rates. this fall with those squirrely markets i went from 3% cash to about 18%. basically we have had a good run for 10 years and i took some off the table instead of getting greedy. we own a house outright for a little diversification as we could always airbnb it or rent it and live somewhere cheaper if necessary. i like that cash cushion and will rebalance accordingly. it feels good to have 4-5 years of cash if we needed it. this is a good discussion. oh, and i just wrote a little something about the best index if you invest that way and the nasdaq beats the s+p500 in up markets. don’t most of us count on up markets in the long term? i think folks get so wrapped up in the VTSAX dogma they will not even CONSIDER an alternative or partial alternative that COULD boost returns. but what do i know? i just ate paste for lunch. Yeah I saw that. NASDAQ and QQQ are great options, I guess VTSAX does incorporate that, so you capture some of it. But again, Simple is the best. So trying to make it easy as pie. Taking some off the table once you’ve won the game is definitely a good play. At the time being, we’re still building everything up, so I think throwing it all in the fire is working for us. I like the layer cake approach. Like Freddy above, we had 100% equities until a few years ago. Now, we’re about 22% bond/cash. I became more conservative as I age. If the market drops a huge amount, I’d probably shift some back toward equities. Anyway, I don’t think 20% diversification makes a huge difference when you’re not withdrawing. It’s a small percentage. I think that’s the way we are leaning. Keep throwing it all into equities at the moment. Then we’ll layer on some bonds/cash as we get closer, or even after we pull the plug and make it happen. They have their place, but I think we’re waiting for the time being. Really good short article that puts asset allocation in perspective. Thanks! I spend so much time fretting about what specific stock/bond mix to use, when really I should be spending my mental energy on figuring out how to throw more money into my investments during this dip! This!! So much this! The investment strategy will really only shave months off your timeline. But, your savings rate can shave years off. This is exactly where the time should be spent! When financially independent at an age much earlier than traditional retirement, I often wrestle with these questions of maximizing return or maximizing passive income etc. I like the 3 models and discussion. At some point, if your savings is above and beyond what you need for annual expenses under the 4% rule it seems wise to shift to maximize overall risk adjusted return despite volatility since this will net the biggest return in the long run. If savings is sufficiently high and the time horizon for investment still long, would it ever make sense to be in bonds or only move to more passive income producing stuff as the time horizon shrinks? I think there’s an article somewhere that talks about the idea that once you’ve won the game, you can take your foot off the gas. I feel like that’s appropriate at times. 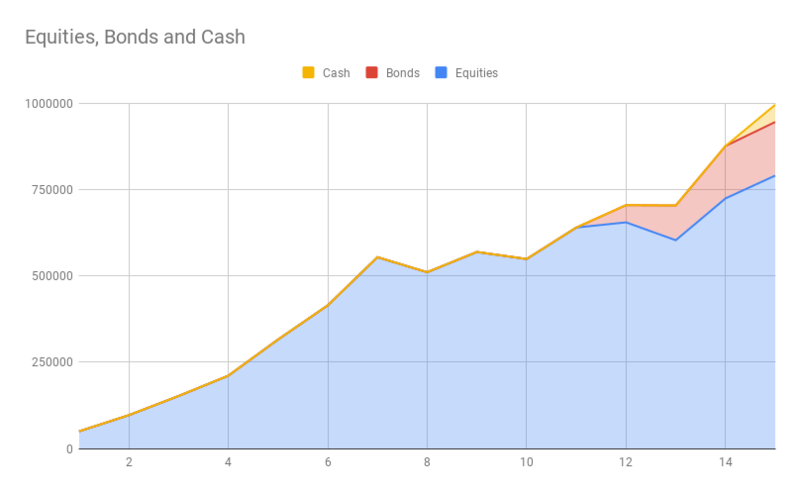 Currently, I have 23% vested in the equity, leaving 77% in cash. It depends on the individual preferences. I think you are exactly right. The only wrong investment strategy is spend everything you earn and then some. Good stuff, Mate! I’m a proponent of going “all in” with equities until I turn 60. Then I’ll consider a small amount of bonds to sprinkle in the mix. Course we also have real estate which is an excellent hedge. Hopefully you can stash up some money to give it a go when the next real estate down turn hits. Yeah that is kind of the plan. As we have built up this large pile, I think I want to start diversifying into some real estate. Just not locally. I’ve come to think of bonds as a psychological tool as much as a financial one. Remember the film Castaway? Bonds are the volleyball companion you can talk to that helps you endure the down market (or years of isolation on an island). If it gets you through the difficult period without losing your resolve, it’s a winning strategy. Look forward to seeing how your journey evolves. What ever it is that keeps you away from cashing everything out is a winning strategy as far as I’m concerned. So, yeah it’s all back to what allows you to sleep at night. I like the simple names you’ve given to these approaches so they are easier to discuss. I am currently somewhere between all in and layer cake. As FI date approaches, I expect to shift closer to layer cake in order to hedge against sequence of returns risk. After 5-10 years of FI I’ll probably be back to “all in” again. Then again, a lot of it depends on what Mr. Market (ie, the CAPE ratio) is looking like as my FI date approaches. Maybe I’ll just spend my entire last year of working hoarding cash instead of investing so that I have the option to ride out a year or two of a down market without drawing down my portfolio. This is exactly the way we are thinking. I like the idea of having a bit of a barrier. But in the same vein, maybe it makes more sense to keep it all invested. You’re only going to cash out little bits at a time, and maybe that large bunch of cash that’s not growing could end up costing more? I guess it’s all about the mentality. Nice graphs! Layer cake makes the most sense to me and gives you peace of mind as you get closer to your quit date. I’d especially want to be able to sleep at night during the first 3-5 years of retirement without having to worry about sequence of returns risk. That’s why the layer cake approached worked for us, because our cash cushion was so helpful during the oil crash of 2015. Now we barely even have to look at what’s going on in the market–5% drop in our portfolio? Yawn. Back to sitting on the beach and enjoying life! We’re leaning that way as well. I think as it gets closer and closer we will keep some cash on hand so that we can weather some storms. It should help and will allow us to invest more as we see fit as well. Really good article. I saw lots of information here. I also like the layer cake approach. Nice job and go ahead. I had a good read! I like the layer cake the most! Thanks for sharing this very informative post!